Stretching the One Income Dollar: Homemade Shake n`Bake for Chicken- Hubby Says Yum!! Homemade Shake n`Bake for Chicken- Hubby Says Yum!! 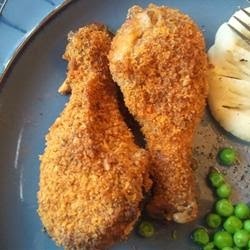 Was looking for a recipe for an easy homemade chicken coating- much like Shake n Bake and with ingredients you already more than likely have in your home. Found the perfect one on All Recipes.com. Give it a try the next time your coating your chicken.